Say ‘‘mushroom mille-feuille’’ to most veteran cooks and eaters, and they will most likely picture a golden mound of puff pastry filled with wild mushrooms in cream and herbs — a fine dish, if old-fashioned and increasingly rare. Early this summer, I was steered by the elbow to Dirty French, the newest New York restaurant from Rich Torrisi and his partners. Their first, Torrisi Italian Specialties, a reimagining of Italian-American classics, opened in 2009 on Mulberry Street. Dirty French, which opened in the fall of 2014 on Ludlow Street, handles sort-of-classic French food in a similarly playful manner. And that’s where I was commanded by my dinner companion to order the mushroom mille-feuille: ‘‘It’s the best thing on the menu,’’ he insisted. I wasn’t sure what would be placed before us, but I certainly wasn’t expecting this: layers of paper-thin mushroom slices, seasoned, buttered, pressed in a pan and chilled for a day, then sliced and seared and served with a piquant sauce. Think of the best pommes Anna, but with the firm, chewy texture of good mushrooms, perfectly crisped and graced with a colorful purée. It’s not literally a mille-feuille, which translates as ‘‘a thousand leaves,’’ but more like 50 or 75 layers. The sauce, which on my first visit was a green curry made with ramps, is neither irrelevant nor lily-gilding, though the mille-feuille itself is so enticing that just a little soy sauce and lemon would complement the mushrooms’ earthiness well. Simple as it sounds, this dish was the most interesting thing I’d eaten in months. 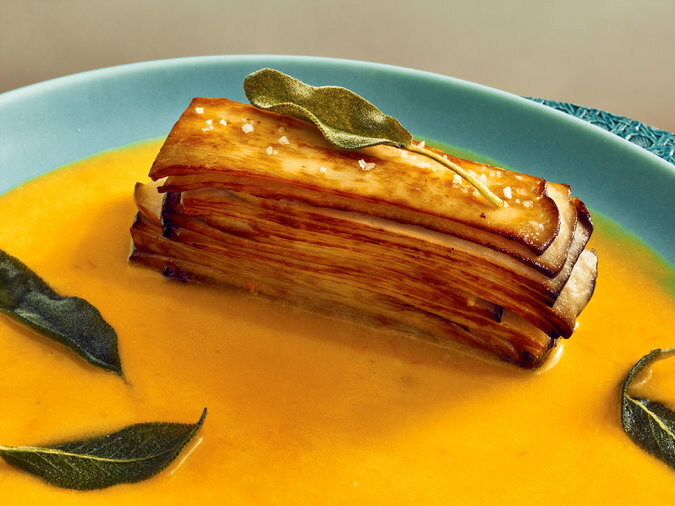 The next morning, I was on the phone with Torrisi, asking him if the mille-feuille was too complicated for us — that is, for you and me, ordinary home cooks. ‘‘With a little patience, anyone can do it,’’ he said. Soon I was in the Dirty French kitchen, where Torrisi, along with Dai Matsuda, the chef de cuisine, greeted me with a huge pile of sliced king trumpet mushrooms and a pot of melted butter. In their hot and busy kitchen, we went to work, buttering, salting, layering and repeating.